'Ariel' being used to raise 'Cumberoona', which is without its paddle, with the barge 'Stella' on left (the caption provided for this image by Harry Godson). See 'History' note in 'More info' for information that disputes this. 'Ariel' registered at Port Adelaide, 1868, official number 55596. Built in Goolwa, 1867, by A. Graham. Rebuilt in 1912 as P.S 'Kelvin', official number 122737. (Godson numbers 96A/12/9, J/13, also K/10C). "This is most likely raising the Hartley barge and probably 1909 but could be 1906 as she sunk at Murray Bridge in both these years. Randell owned the Hartley and the Ariel and a 1906 newspaper report on the raising of the Hartley barge mentions the Stella being positioned on the outside of the Hartley. River doesn't look right to match the 1906 newspaper article so I am going to put my money on the 1909 sinking. 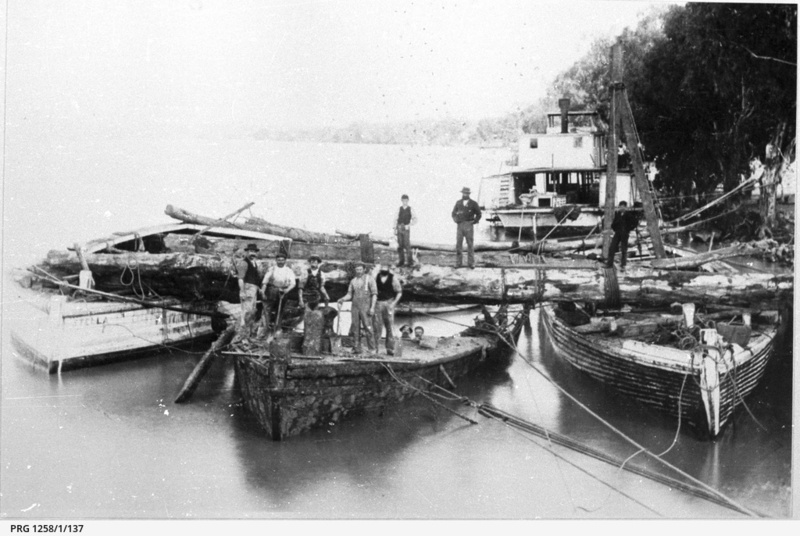 'Cumberoona' sank in 1889 and then became a total wreck at Christmas Rocks on the River Darling, being finally blown up about 1892 to clear the navigation path in the river. It is therefore very unlikely that this vessel being raised was the 'Cumberoona', unless the date attributed to this image is incorrect', [from information supplied by paddle steamer researcher].